For people who want to have a quick look of the movie instead of storing for collection, renting movie from iTunes store is a great deal to save the budget. Even, some iTunes rental only costs as low as $2.99 while the quality of iTunes rental is as same as the purchased one. Now, you may have already rented some iTunes rentals, but soon you would discover many restrictions in the iTunes movie rentals, especially the limited watching period. To get rid of the iTunes rental limitation and keep iTunes rental forever on your device, we introduces you the effective solution to totally remove DRM protection from iTunes rental and help you keep your iTunes rental movies on computer or your iPad/iPhone/iPod forever. Not only the restrictions on iTunes rentals, the iTunes purchased videos also has limitations. That is DRM (Digital Rights Management). All iTunes videos are protected by Apple FairPlay DRM and they are only can be watched under authorized computer and Apple devices only. For iTunes rentals, the DRM stops you from keeping iTunes rentals longer than 30 days in iTunes library and shut the door on watching the iTunes rentals more than 24 hours (in the US) or 48 hours (elsewhere) once you start playing. 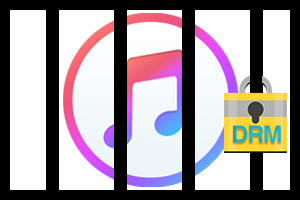 To set iTunes rental free, the very first thing to do is to remove DRM. When considering remove DRM from iTunes videos, M4VGear DRM Media Converter is the best one among the iTunes DRM removals in the market. M4VGear DRM Media Converter supports converting both iTunes purchased and rented movies losslessly to other plain video or audio formats, such as MP4, WMV, MOV, MP3... at 20X faster conversion speed. It has Mac and Windows version that are perfect for people who are running Mac or Windows OS. Launch M4VGear, either click "Add Movies" button on the upper left or on the center of the interface to add the iTunes rented M4V movies. You can also drag & drop the iTunes rental to load in M4VGear. The screenshot below shows you how it looks like when you add iTunes files with M4VGear. The left illustrates Mac version while the right one illustrates Windows version. Move to the bottom left, click the selection button besides "Convert to" and choose "Same as source for MP4" as output format. Of course, you can choose any format you want from the output format list. Adjusting the parameters (video codec, bitrate...) is also available. Press the "Convert" button on the bottom right to start removing DRM and converting iTunes rental movies to normal MP4.. video file which is of lossless quality. Once it finishes conversion, you can open the output folder to find the converted video file. Now you can save the converted iTunes rentals as long as you want on computer or iPad/iPhone/iPod. Note: Be sure that the iTunes rentals are in valid period and have not expired. Keep AC3 5.1 audio and all multilingual subtitles & audio tracks. Strip iTunes DRM and Convert M4V to MP4, MOV, AVI, WMV, MP3, AAC etc. Preserve 100% original quality at 20X faster speed. Note: M4VGear will offer you a 1-minute free trial which allows you convert one minute of each iTunes M4V videos for free. If you want to unlock the restriction, now buy the full version with $44.95 ($49.95). iTunes M4V Converter Comparison, Which is Better?